📅 June 2016 December 19, 2018 by Bruno B. Three days in Stockholm is not a lot but is certainly enough to get a good grasp of the city’s culture and modern lifestyle. This was exactly the time I spent in the city, so hopefully my itinerary it can be a good reference for your trip too! For reference, this is the overall three-day plan. Details about each one of these places follow! Arrive. Indulge. Explore. That’s how every first day in every new destination should be, right? 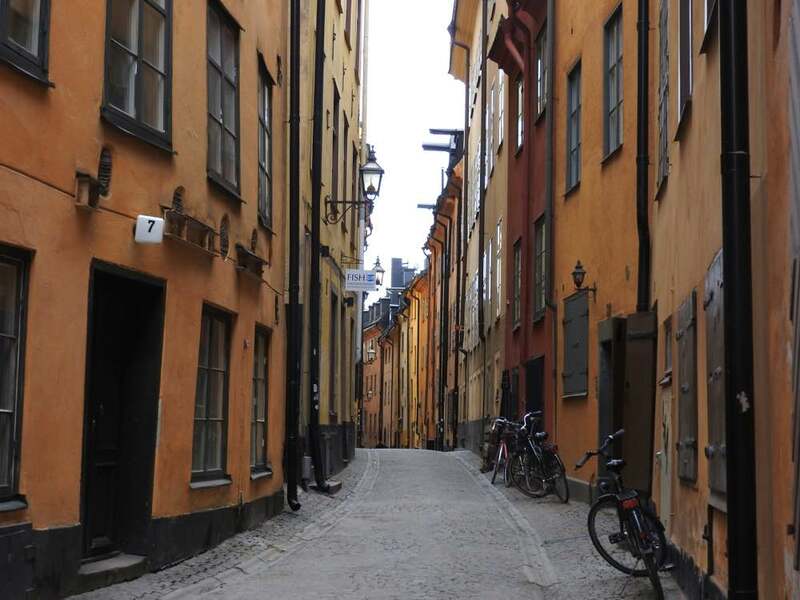 Head straight to Gamla Stan, the old town of Stockholm, for a real historical feel of the city. Gamla Stan is one of the 14 islands in the city and one of 30,000 (!) in the whole region of Stockholm. Dating back back to the 13th century, it consists of charming medieval alleys, cobbled streets, and impeccably preserved architecture. Don’t miss Stortoget square! Even though it’s the heart of the old town where you can expect many tourists, it surprised me how peaceful it can be. It’s a great place for people-watching. Sit in one of the outdoor tables, enjoy a hot beverage with a blanket covering your legs and enjoy. Under the right lighting, this is a postcard-perfect spot! Other points of interest include the Kungliga Slottet (Royal Palace) and the Nobel Museum, although I didn’t enter neither. 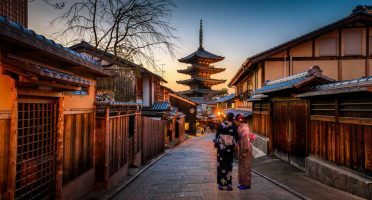 The whole area is relatively small and easily walkable in a morning or an afternoon. It’s a good place for a free walking tour if you are interested in getting to know Swedish history and culture in more detail. 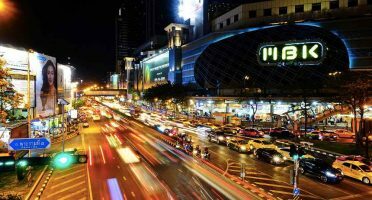 What best place to feel the vibe of the modern city than in local markets? Compared to the markets in Barcelona or in Lisbon, I found Östermalms Söderhäll to be a very civilised place. 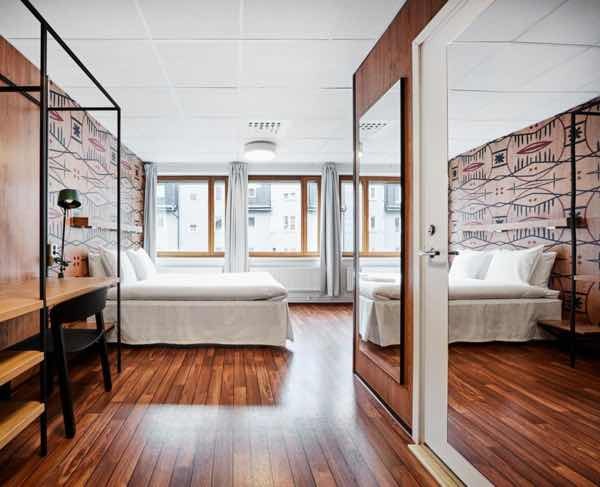 No wonder you are in the posh neighborhood of one of the stylish european capitals. There are no vendors shouting for attention, no loud talking. Just superbly displayed food, fruit and vegetables, the way that makes you salivate heavily just by looking at it. Gravlax looked particularly delicious. Served as an appetiser we turned into lunch, it consists of raw salmon, cured in salt, sugar, and dill. Salmon in Sweden looks more pinky and yummy than usual – probably because it is mostly caught in open waters – don’t miss it! T-Centralen is the busiest stop in T-Bana system, with several interconnecting lines. The blue vines and flower motifs running along the walls offer a soothing opportunity. That was the intention of the artist anyway. It might be weird to you to visit the Metro as opposed to use it to go from point A to point B, but that’s something you should definitely try out when in Stockholm! 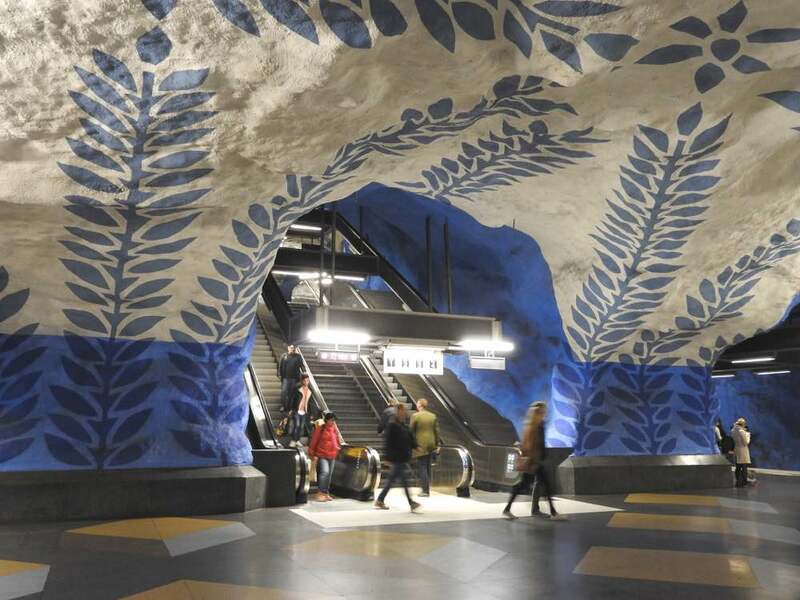 With an extension of over 100km and 90 stations, the Tunnelbana (T-Bana) is believed to be the world’s longest art exhibit. You can find here are all kinds of paintings, sculptures and mosaics that turn an ordinary commute into a memorable art journey. The public transportation agency, locally known as “SL” organises free guided art tours led by certified guides during summertime (here’s a comprehensive review of the tour by the guys at Slow Travel Stockholm). We started off our day hopping on a ferry to Djurgården, nicknamed the Museum island. It’s here that you will find some of the most important museums of Sweden like the Skansen, the ABBA Museum and the Vasamuseet. Apart from that, walking around Djurgården is a delight by itself. This green island is a favorite amongst locals and tourists, ideal for a long stroll with inspiring views. It’s the perfect place to unwind from the busy dynamics of the city. The funny thing is that it’s not busy at all compared to most european cities! A highlight popular with locals in Djurgården is the Gröna Lund, the city’s amusement park. There are more than 30 exciting rides to choose from! Vasa is so big it was impossible to make it fit properly in a picture. Vasa is the name of a 17th century Swedish warship, built on the orders of the King Gustavus Adolphus to be the greatest war machine ever built. Sadly, the ship sank after sailing for about 20 minutes in the very heart of the port of Stockholm. Three centuries later, it was recovered from the bottom of the sea and a museum was born, with 98% (!) 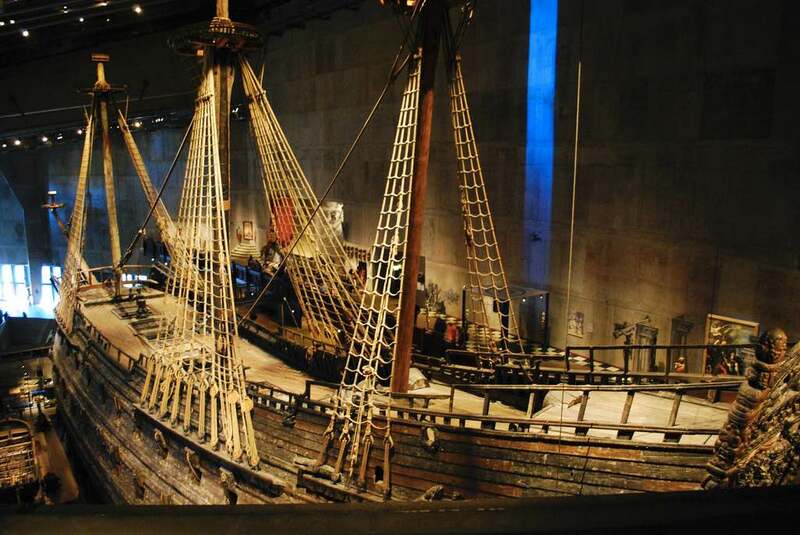 of the original ship displayed nowadays in Vasamuseet. This was the #1 attraction my friends recommended me before my trip and I could immediately realise why. You can’t help to whisper “wow” when you first see the ship. It’s impressively huge, unique and beautiful in every single detail. Highly recommended! 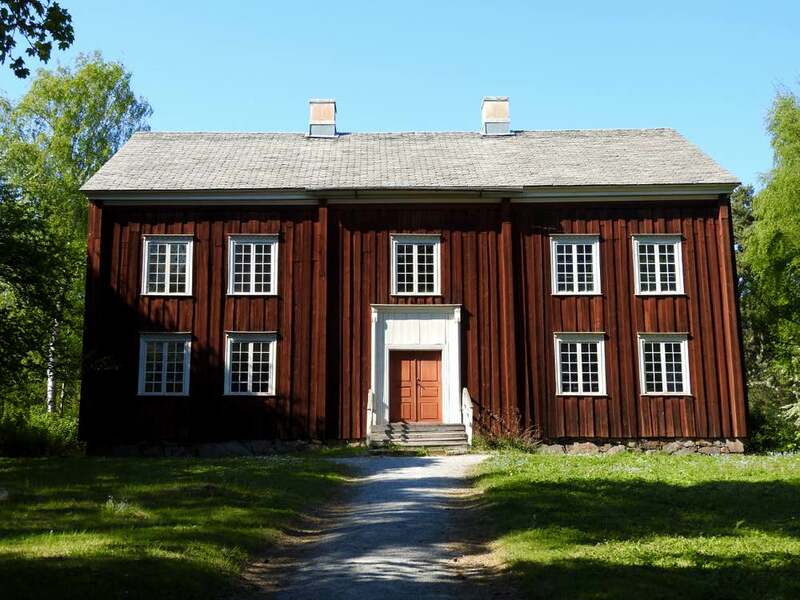 Skansen: How Did Swedes Live Centuries Ago? Skansen is one of the first open-air museums in the world and also a zoo. It was founded in 1891 with the intention of showing the way of life in the different parts of Sweden. More than 150 traditional houses have been dismounted throughout the country and reassembled here. The first comment I have about this place is that is absolutely HUGE. You can easily spend an entire day here! I really enjoyed the interactive aspect of it. There are actors playing the role of local from several regions of Sweden and also local animals like wolves, bears and elks. You can touch, smell and feel almost everything which is awesome. Skansen is also place of election to some of the most important events of the year like the Midsummer (Summer Solstice) in June and a Christmas market in December. If you are around in these times of the year, don’t miss it! The vibe in Södermalm is trendy and creative, borderline hipster level, I’d even say. In fact, it was voted by Vogue magazine as the “coolest neighborhood in Europe”. People from all sort of urban tribes converge in these streets filled with bars, restaurants and shops. Another reason to visit is the Millenium Trilogy. I’m a big fan of the books and seeing the description of the district where the main characters lived was special. There’s even a Millenium Tour which takes you to the main spots of the narrative. The killer view from Monteliusvagen. Remember this name, Monteliusvägen. Head to this small walking path that starts on Mariatorget – a beautiful spot in Södermalm -for the most magnificents view of Stockholm. From up there you can see Mälaren Lake, the City Hall and Riddarholmen all within a delightful sight. Buy some snacks and join the locals for the sunset show. Feed your artistic side @ Fotografiska. 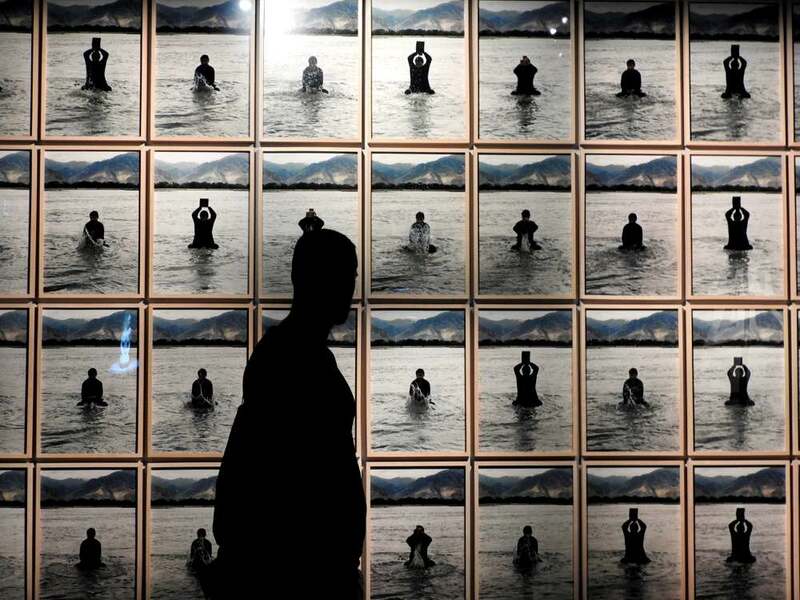 If you are into photography, you absolutely can’t miss Fotografiska. 4 large exhibits and 20 smaller ones are displayed here annually, all top-notch material that draws you in of how beautiful it is. I loved the way the lighting in the rooms and the artistic elegant setting uplifted the collections almost at individual piece level. Very smart. Even if you aren’t a photo geek, the top floor café/restaurant run by the well-known chef Paul Svensson has a stunning view over Gamla Stan (and one of the most stylish bathrooms I’ve seen). Despite a bit pricey – what isn’t in Stockholm anyway? – it’s excellent for a fika time with friends. Or in a date. Or with the entire family. Or even alone! I personally have a huge admiration for Swedish culture, art and lifestyle. Visiting Stockholm was a chance to experience what I’ve been seeking for years. It felt special. They seem to be one step ahead in that is evident for travelers just visiting by. As a bare minimum, I think you can expect to step into a capital of the true first world! Disclaimer: some very random facts will follow. Rumours are true, it is expensive. 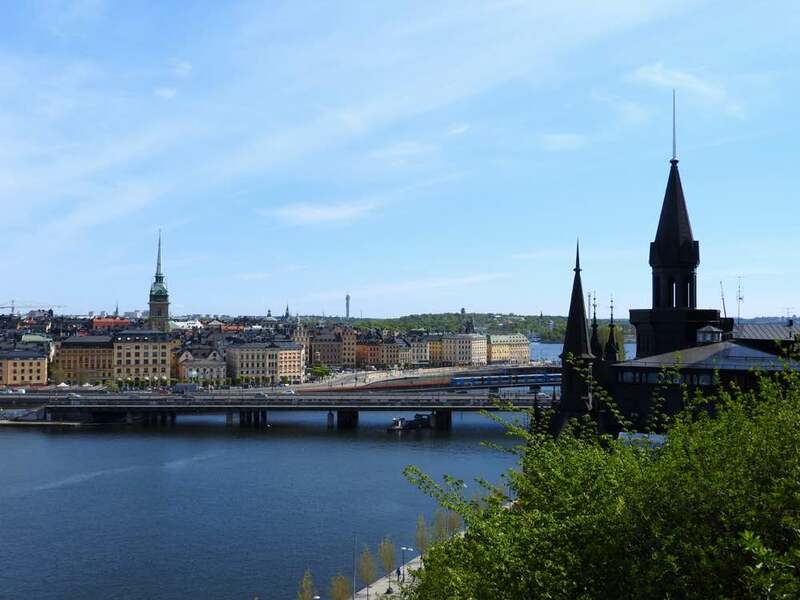 I don’t exactly travel on a shoestring, but I do try to keep a budget and Stockholm was a real challenge in everything: food, accommodation, transports. The good news is that there always ways to your expense list and visit Stockholm on a budget. It does not feel like an European capital. It’s more of a big village. Stockholm is a cool city, in every sense of the word. The architecture is cool, everything on the plate is eye-catchy and people look cool. I don’t remember being in a place where people dressed up in such an edgy way. Fashion sense here is definitely something big. Cinnamon rolls/buns are freaking delicious. What have you done in Stockholm? Were three days enough?